Cast: Takeuchi Yuko, Abe Hiroshi, Kikkawa Koji, Ikeuchi Hiroyuki, Tamayama Tetsuji and Sano Shiro. After a little girl is saved by a medical team that focuses on heart-diseases, the team got to stay and started becoming famous. But one day the ‘death in surgery’ patients started to grow, and the lead surgeon Kiryu Kyoichi (Kikkawa Koji) asked for an inquiry as he did not understand what happened so differently in the surgeries that made these people die. 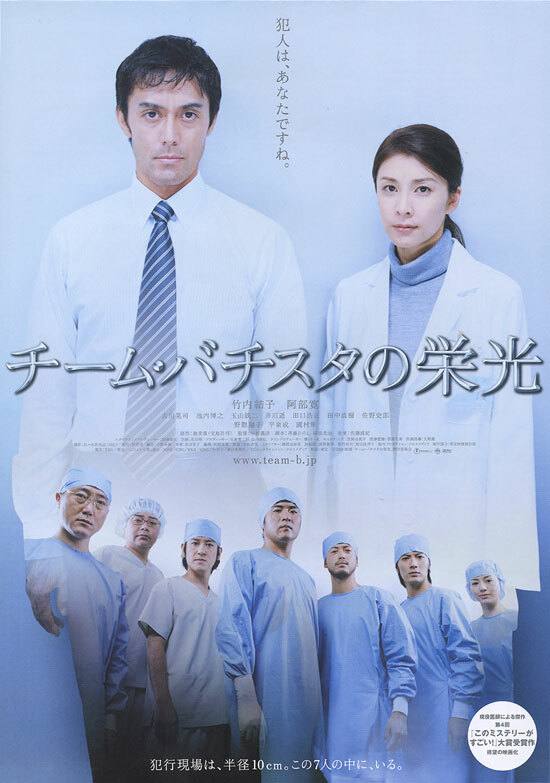 When the hospital chief invites a friend of his, the friend sends Taguchi Kimiko (Takeuchi Yuko), a doctor who listens to patients complain. She is asked to investigate the surgeries as an objective third party, and while doing so, she does not find any reason for the deaths. When the secretariat of the ministry of health and labor Shiratori Keisuke (Abe Hiroshi) comes to her clinic and tells her that he believes its murder, Taguchi joins him in re-investigating and finding out what really is the reason for the deaths.. I was looking forward to this, because I was in the mood for a medical movie, and to tell you the truth, if you are considering this a medical thing, it’s not. It had so much ‘detective’/’figure-out-how-they-did-it’ bull that I was seriously upset half way through. But once I started to focus I started getting more interested and it was fairly good. The ending was surprising and the acting was okay as well. Though I didn’t really get any character development, which ruins a lot, I gotta admit I was fine with it. Recommendable? Yes, if you like those movies that find out about truths and lies… whatever.